Rubblebucket’s Sun Machine is the soundtrack for a party I want to attend. 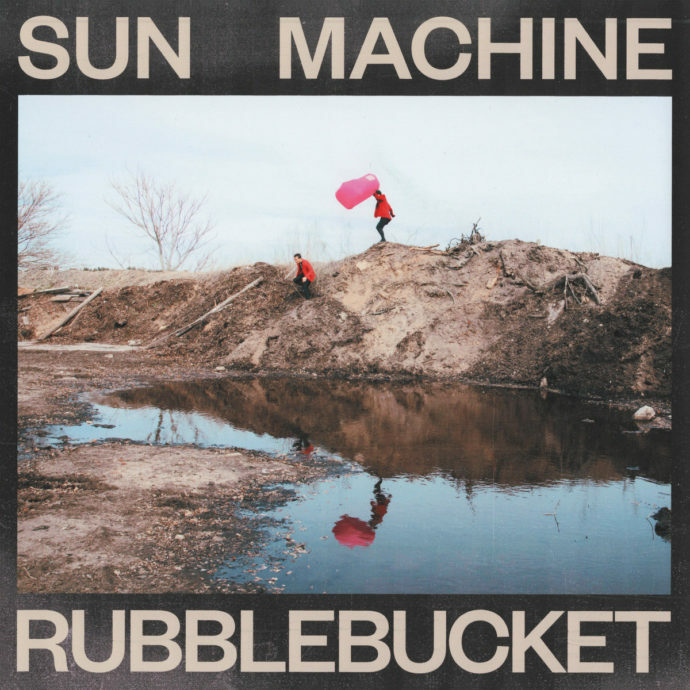 Sun Machine is the fourth full length album from indie-pop band, Rubblebucket. Serving danceable funky and ska-infused arrangements, a recurring theme throughout is the act of healing through movement and music. There’s a bright note of optimism running in all the tracks, even the spoken interludes, of which the album boasts three. The three spoken interludes, “AURATALK,” “VANTALK,” “HURTALK,” sound like recordings of the stoned discussions of a group of friends. “VANTALK” in particular is a seven second snippet of silliness, ending in a great burst of laughter, which exactly captures the essence of Sun Machine. The album is bright and sunny, brimming with fun. And in this way the title, Sun Machine, is perfectly appropriate. The album starts with “What Life Is,” a propulsive, sparkly number featuring a wild saxophone solo. In fact, the first four tracks all sound similar, belonging to the same party. Simple guitar chords, the occasional electronic burbles, and the ever-constant fat saxophone bring the grooviness. The intro is an unabashed invitation to move in any way that feels good. “Fruity” is a quieter number, featuring more prominent synth that had been lacking in the previous tracks. If the prior songs represented dancing wildly without care, “Fruity” is the time for a gently sway and head bob. The slightly spacey “Formless and New” is darker, more intense, yet just as propulsive. Smacking drums and industrial synth suggest the “Machine” part of the title of the album. “Annihilation Song,” despite the ominous name, is an upbeat, bass heavy track. The lyrics “This is annihilation” are sung over tribal-sounding backing vocals, making for an interesting contrast. The track “Sunlit Sparks (I Won’t Break You)” sounds the most experimental and out-of-place on the album. Travers’ usually buoyant vocals are masked behind an abrasive vocoder and the synth sounds more fit for Yellow Magic Orchestra than Rubblebucket. Luckily, the closer “Habit Creature” returns to Travers’ unfiltered, soothing voice. The saxophone and propulsive drums nicely tie back into the start of the album. A direct message to the listener, Travers implores us, “Habit creature / You gotta touch yourself / To feel what you’re feeling,” to begin healing. And I think anyone who’s listened to the album completely will be ready to do that.